According to a new poll from released today by Abacus Data, Canadians are least likely to believe that Atomic Energy of Canada Ltd (AECL), the Crown Corporation responsible managing Canada’s national nuclear energy program, should be privatized. Between June 23 and 24, before reports of AECL’s pending sale became public, Abacus Data surveyed 1,005 Canadians and asked whether the Federal government should privatize or keep public eight crown corporations. Before answering, respondents were given a short description of each corporation to ensure they had a sense of what each was responsible for. 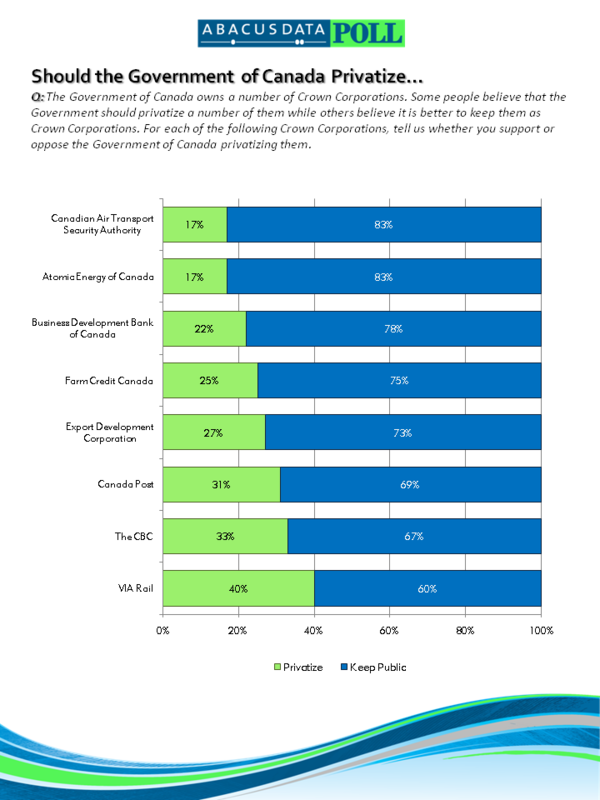 Generally speaking, Canadians are not keen on privatizing any of the Crown corporations we tested, but were particularly opposed to privatizing AECL (17% privatize), the Canadian Air Transport Security Authority (17% privatize), and the Business Development Bank of Canada (22% privatize). Support was highest, although still a minority opinion, for privatizing VIA Rail (40% privatize), the CBC (33% privatize) and Canada Post (31%). Despite the recent Canada Post lockout and subsequent back to work order from the federal government, only three in ten Canadians believed that Canada Post should be locked out. And although, as we found in a survey released last Wednesday, a majority of Canadians believed postal employees should not have a right to strike, most Canadians are not on side with those who believe Canada Post should be privatized. Similarly, calls for the privatization of CBC are not backed by Canadian public opinion – at least not yet. When asked if CBC should be privatized, only one in three Canadians (33%) said it should be while 67% believed it should remain publicly held. For those who wonder why the Federal government has not made any mention of privatizing Canada Post or the CBC, we need to look at the numbers by political party supporter. Supporters of the NDP, Liberal Party and Bloc Quebec all overwhelmingly oppose privatizing any of the crown corporations tested. Interestingly, only 14% of BQ supporters want to privatize the CBC, the lowest number of all the party supporters. When it comes to Conservative party supporters, support for privatizing Canada Post or the CBC is much higher than among other parties. Nonetheless, there is still a large minority of Conservative supporters who are opposed to privatization. Fifty-three percent of Conservative Party supporters support privatizing the CBC while 47% oppose it. Similarly, Conservative supporters are evenly split when it comes to privatizing Canada Post – 50% support privatization while 50% oppose it. By and large, Canadian public opinion, at least for the moment, does not seem to be primed for any moves to privatize any Crown Corporations. We need to keep in mind that apart from commentary from taxpayer advocates, conservative commentators, and private sector analysts, most Canadians are not thinking about this issue on a day-to-day basis and thus have not had a real opportunity to form an opinion. But for proponents of privatization, the results of this survey suggest that they start off well behind those who want to keep corporations like the CBC and Canada Post in public hands in terms of getting the public on their side. Finally, the sale of parts of AECL may be a tough sell with much of the public. This survey suggests that the Federal government should tread lightly and work to dispel any fears that may rise over the safety of nuclear power. Based on the tragedy in Japan, public confidence in nuclear is down and at this point the public seems to believe that such “power” is better left in the hands of a government-owned corporation.